A fireworks display in Yamanashi City, Yamanashi Prefecture. The “star mines”, created by combining various fireworks launched in succession, are brilliant enough to enrapture onlookers. Come experience the impact of the gorgeous colors, shapes, and power. At this fireworks festival symbolizing Kobuchisawa, the town of horses, mini games related to horses, character shows and horseback riding is held in the afternoon. In the evening there are plenty of events including a horse show and fire performances, a show by Fuchi-no-Oto Taiko drummers, and a BMX stunt show. Come and enjoy the entire day. 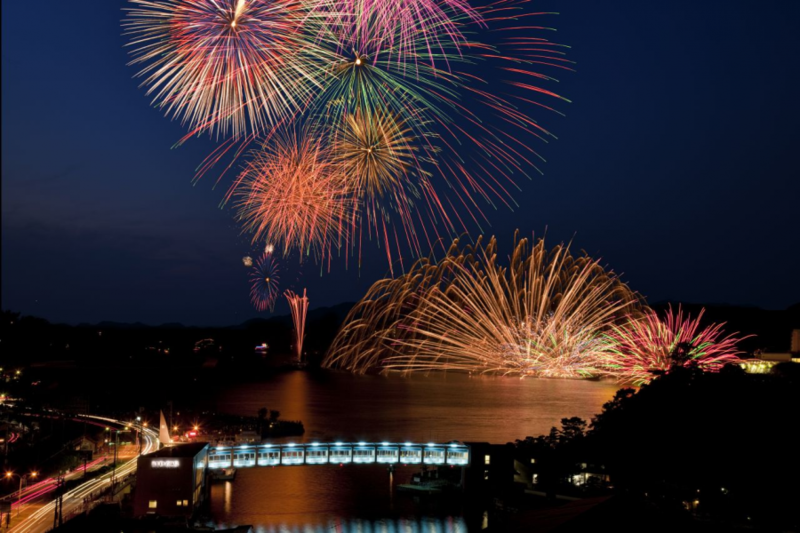 One of Japan’s top fireworks displays, held in Suwa City, Nagano Prefecture. 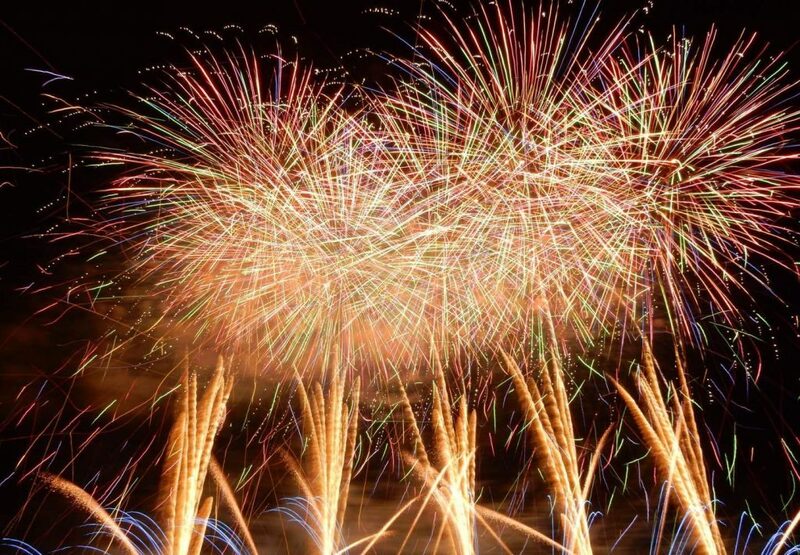 The display is composed of two parts, the fireworks competition on land, and the water-top star mines only made possible by the massive Lake Suwa. The continuous colossal fireworks never give spectators a moment to catch their breath. We recommend watching the display from close to the lakeside. A summer tradition in Ueda City, Nagano Prefecture. Enjoy roughly 1000 fireworks illuminating the summer night sky while bathing in the pleasant nighttime winds off the Chikuma River. Many street vendors are set up along the river, and the crowds are full of energy. A fireworks display in Azumino City, Nagano Prefecture. A large scale display where you can see around 12,000 fireworks launched, with the special feature of coordinating the display to music. 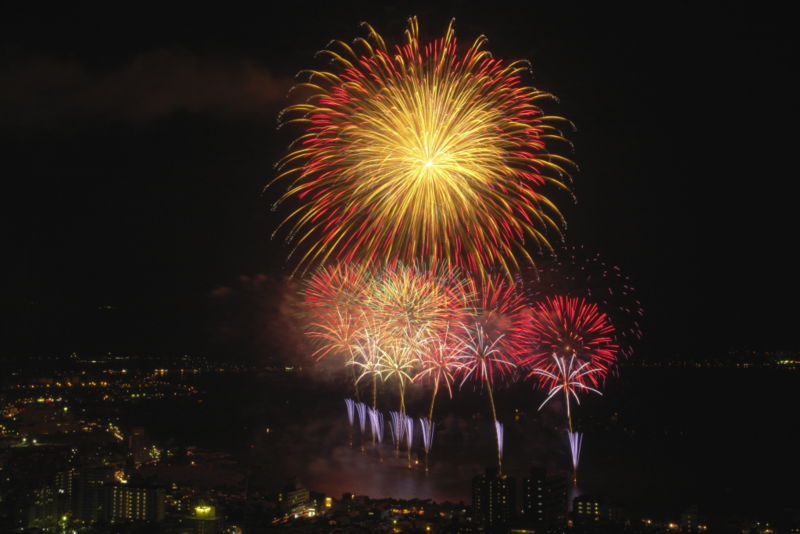 An annual fireworks display in Shizuoka Prefecture’s Atami Bay, held over the course of seven days. Around 5000 fireworks are launched without interruption. Enjoy the powerful and fantastic sight of silver light raining down from the sky, illuminating the area around the ocean as if it was mid-day. The biggest event at Ito Hot Springs in Shizuoka Prefecture’s Ito City. 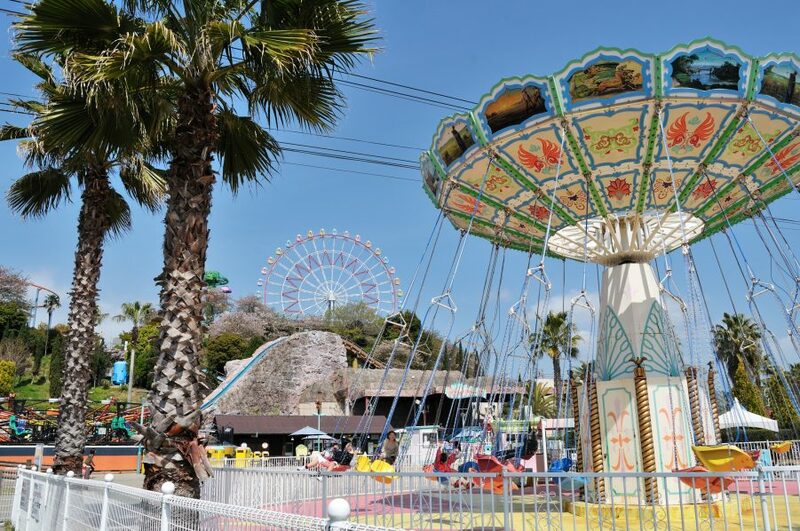 The festival is comprised of three parts, “Anjin Festival: Matsukawa~ Flowing Lanterns Fireworks Launch”, “Anjin Festival: The Thunder of Taiko Drums Fireworks Launch”, and “Anjin Festival: Fireworks Display of the Sea”, spread over three days. Roughly 12,000 fireworks will be let off over the span of the three parts. A summer tradition in Shizuoka Prefecture’s Ito City. 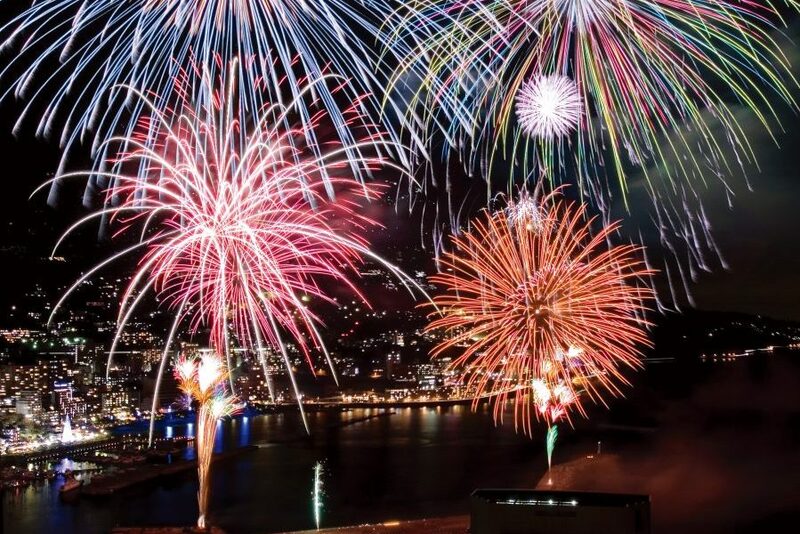 Between July 30th and August 26th, roughly 11,000 fireworks will be set off over a total of 10 nights. Sit and relax on the grass and enjoy the beautiful display. A festival in Ito City, Shizuoka Prefecture. 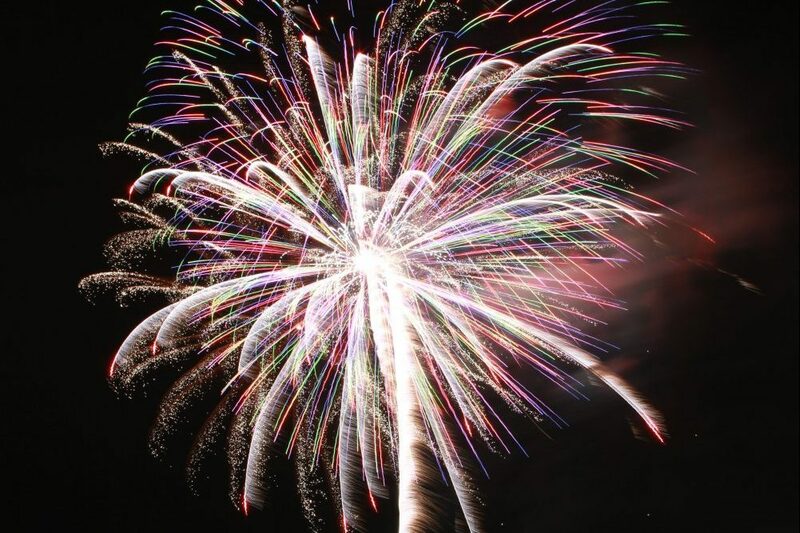 For 30 minutes, roughly 1500 fireworks are launched off the Ito coast. The diagonally-launched star mines, and other fireworks only possible when done on the ocean, are a must-see. The approximately 50 handheld fireworks are also a highlight. Thousands of lanterns, on which people have written their wishes, are set afloat on Uchiura Bay in Shizuoka Prefecture’s Lake Hamana. Overhead, star mine fireworks are launched, creating a truly fantastic scene. 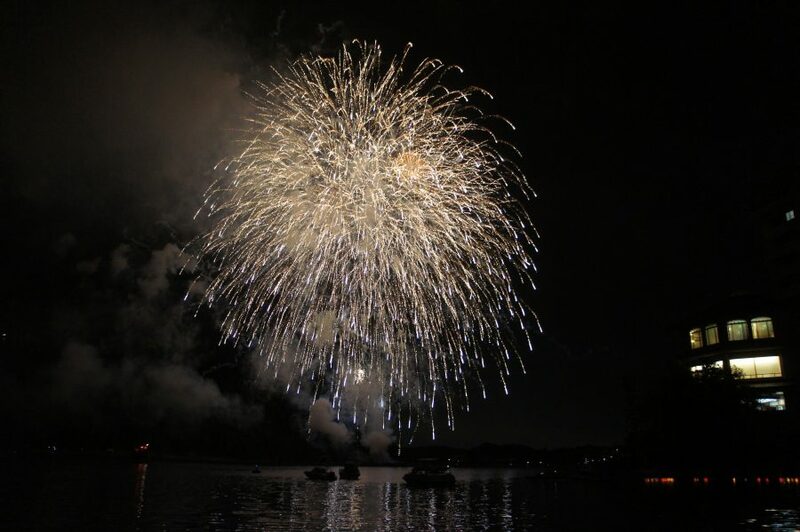 As the finale of their nighttime operations, a fireworks launch, “Fireworks Night”, is held at Lake Hamana Pal Pal in Hanamatsu City, Shizuoka Prefecture. During the event period, each night slightly different fireworks will be set off to illuminate the night sky. The fireworks combined with the illumination of the giant “Koku” Ferris wheel create a spectacular sight. A fireworks display included among the three great fireworks competitions in Japan. Various types of fireworks are launched in rhythm with music. Come and experience a high level of fireworks entertainment that can only be experienced at completions. With various fireworks with wicks and crafted fireworks, the show will get plenty of oohs and ahhs from spectators. The famous on-the-water fireworks color the water’s surface like a garden of flowers. 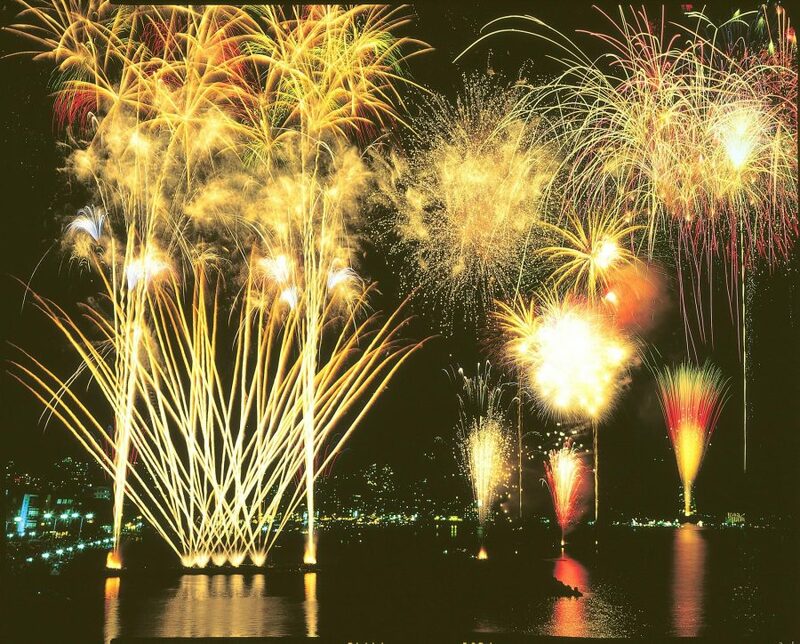 Enjoy a spectacular sight as the fireworks and lights of pleasure boats reflect on the water’s surface. More that 5000 fireworks will be launched. During the event period stalls selling food and drink, etc. will be set up, and the fun starts from the evening. A massive summer night spectacle with a passionate night parade, dramatic projection mapping, and a fireworks and music contest “Moonlight Finale”! During the event period, famous Spanish festivals will be held in rhythm one after another.